Rantings of An 80s Nut: Happy 30th, MTV!!! So, with that announcement out of the way last week, I can talk about how numerology plays a part in things. MTV was launched 30 years ago today. Last week, I turned 40. Meaning, I was 10 years old when Music Television came into being. Yes, I spent over a decade celebrating, researching and sharing news and information about that decade. It only makes sense that I would have to finish work on the book about the decade before the end of the year... I mean, just look at all those 'zeroes'. They speak volumes to me. I digress. This was supposed to focus on a birthday. So I'll share my experience with the channel. I discovered MTV late. Well, not really late. I really was 'raised on radio'. Yet, I was spending the night at a friend's house (I think his name was Matt W. but I won't condemn him) when I first glimpsed a music video. I was in awe! I begged my parents to get cable. That didn't work. They were late adopters. I mean, we didn't get our Atari until Ms. Pac-man came with it. Anyhow, I'd have to steal moments at other people's houses until we finally got Music Television. I've told listeners before that I was an avid Casey Kasem listener. There is something about countdowns related to charts and the battle for the top spot that thrilled me. Ok, it was mainly the trivia that came along before Casey would play the song. So, watching MTV's weekly countdowns became just as important later on. But, none more than what happened on July 13, 1985. Summer vacation was in full swing. We were on our way up to Idaho to spend time with my grandparents and aunt. Actually, it wasn't so bad there in their little town as they had this funky dish pointing at the sky with hundreds of channels... including MTV. (Where I first caught the premiere of Falco's "Jeanny" video.) Anyhow, here we are on this trip. For some reason, my family decided to stay a day or so in the itty-bitty town we kept blowing through on every trip to Idaho. But, I'm content... they have MTV in the hotel. My brothers and sister were down playing in the pool and I was glued to the television screen watching something called Live Aid. I don't know how I got away with watching that much uninterrupted TV but seeing some of my 'radio' heroes on stage trying to make a difference meant something... means something to this day. I dedicate part of a chapter of the upcoming book to MTV for taking a bunch of musicians and making them bigger than a radio wave. Breaking artists that wouldn't normally get heard, breaking some that probably shouldn't have been heard or prolonging careers that maybe shouldn't have been -- the network did more to change the trajectory of music than any force during the decade. It may have also been it's worst enemy. 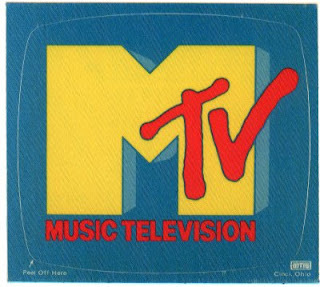 Many imitators arose (many a local UHF station was launched under the guise of a 'free' music video channel, weekend video shows like Friday Night Videos and Night Flight, Canada's MuchMusic and scores of others) and eventually they changed what the M in MTV stood for. But, what a run it was. A history worthy of singing a little "Video Killed The Radio Star" or "Money For Nothing" to celebrate a 30th birthday for it, isn't it?